Breeze is set to become a new benchmark for traditional design with quiet stonewashed effects that blend beautifully with a range of settings. This range radiates simplistic beauty with a 9mm Polypropylene pile that has been created in Turkey with quality construction techniques. • Intricate colour detail, resistance to stains, high durability, non-shedding, mothproof, non-allergic & overall value! Please note: Allow for a slight variation of colours depending on monitor settings. This item cannot be delivered to a PO Box, only to a street address. *The above transit times apply as a general guide, refer to business days & do not include day of pick up. The same cost as returns mentioned above applies. We would suggest measuring your space with a tape measure and laying down some sheets/masking to try and gain some perspective. We encourage at least the bottom of a couch and legs to be on the rug if going in a living room, to help make a room feel spacious, expansive and welcoming, as opposed to a floating/choppier look, a smaller rug can create. Ideally, if budget permits, you may want to consider a rug big enough to fit all legs of the furniture to rest on it. 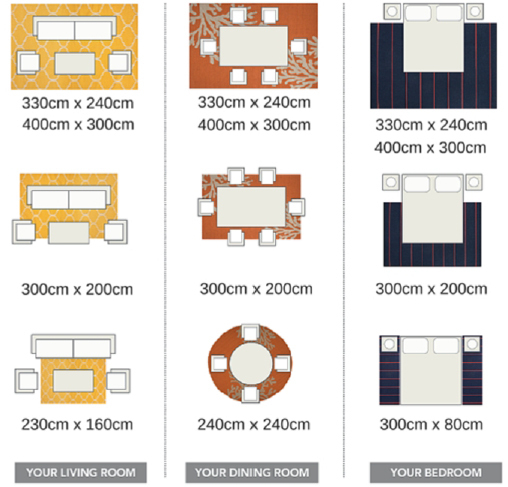 There other factors to consider with sizing for other rooms & areas. Whilst we offer sizing tips, the final decision is with the customer & our returns policy applies. Please contact us for free styling & size advice. Measurements may vary by 2-3%. Returning a rug due to such size variance is classified as a change of mind return and our terms & conditions apply. Returning a rug outside of our 30 day returns window due to incorrect size is not possible.